Los Angeles – Following the recent monetary tightening in China, India, and Brazil, the price of gold has been under pressure, closing slightly lower on Friday at $1,342.30 an ounce, down 1.24 percent for the week. Silver prices closed at $27.44 an ounce, down 3.31 percent for the week. The Gold/Silver ratio (GSR), the number of ounces of silver needed to purchase an ounce of gold, fell slightly to 48.91 as silver got a bit more expensive relative to gold on Friday. The week began with the price of gold rebounding slightly on Monday to $1,361.90 an ounce after China’s announcement the previous week that it had tightened bank reserves for the fourth time in two months. Physical demand remained robust and the Asian market saw increased bargain hunting after prices dropped, with spot supply remaining tight. The euro rose against the dollar to a one-month high on Tuesday following the release of positive economic data out of Germany, the euro zone’s number one economy, raising the economic outlook for the entire region. “The weaker dollar lifted everything as there wasn’t much news out there to drive prices,” said analyst Sterling Smith, with Country Hedging. 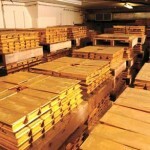 He went on to suggest that gold may have been technically “oversold” after its recent correction. Gold bullion prices rose for a third straight day on Wednesday boosted by a stronger euro, weaker dollar, and robust Asian demand prior to the Lunar holidays. Gold continued to bounce off its recent correction lower, and the spot price being stronger than the futures price pointed to strong physical buying – most likely coming from emerging market countries with rising inflation such as India and China. The gold price ended its rally on Thursday following three days of gains as Brazil became the latest nation to institute an interest rate hike and even discussed the possible “starting of a process” of additional interest rate hikes in the future. Brazil raised the rate 50 basis points to 11.25 percent after inflation reached almost 6 percent in 2010. Nevertheless, gold’s slide Thursday was primarily caused by concerns that China may soon undertake further steps to curb its rising inflation. Aside from its role as an alternative to currencies, gold is often perceived as a hedge against rising inflation in that it maintains its value even as price pressures erode the value of other assets. “While consumer inflation looked to be moderating, an acceleration in Chinese economic expansion might signal a strengthening of inflationary pressures raising the likelihood that authorities will have to respond. This threat of Chinese monetary tightening is weighing heavily on all commodities,” Standard Bank said in a note.